What will happen to fixed income and equity markets when the Fed starts raising its short-term interest rate? History shows that the Fed does not have a strong influence on long-term rates. Usually, when the Fed decides to raise its short-term interest rate, the long-term rates do not increase by the same proportion. Also, as yield spread declines, the equity markets tend to perform well. The history may not repeat itself because of how much influence the Fed currently has over the yield curve. The Fed has a full control of short-term rates and is a large investor in long-term government bonds. When the Fed starts raising short-term rates in 2015, the yield curve is likely to shift upwards. The yield spread is likely to remain unchanged. This scenario is not good for fixed income and equity investors. Historically, when the Fed raised its short-term rates, the long-term rates increased by a lesser amount. 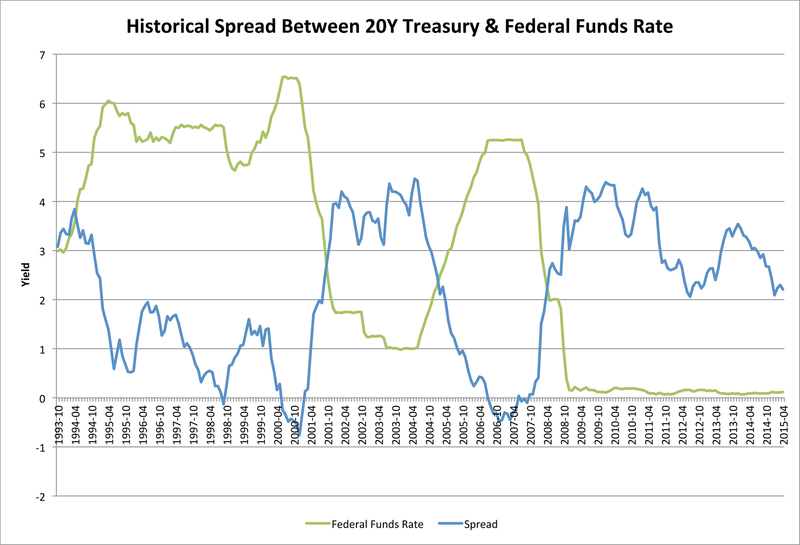 There is a negative correlation between the increase in Federal Funds Rates and the Yield Spread. 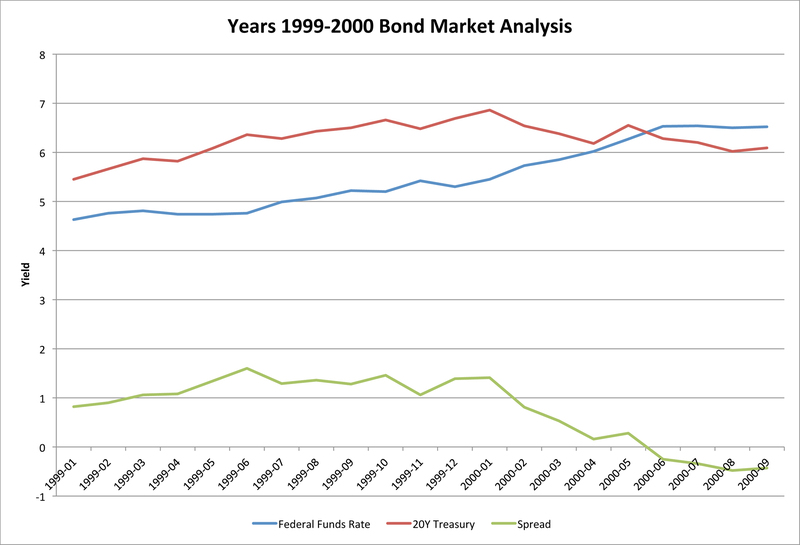 In this paper, the yield spread is the difference between the yield on long-term 20-year treasury bonds and federal funds rate (see chart 1). This paper shows that historically, the Fed did not have a full control of long-term rates. The wider the yield spread the more room for the Fed to raise it short-term rates before causing a recession. The current yield spread is at 2.2%. It is relatively small and does not provide much room for the Fed to exercise its monetary policy without causing economic slowdown. If the Fed decides to increase the federal funds rate this year, but the yield spread continues to decline further, the next economic recession might be around the corner. What the Fed is hoping for is higher long-term rates. Higher long-term rates will provide more room for the Fed to exercise its monetary policy. The Fed would like to keep the yield spread constant or even increasing. Historically, the Fed did have a strong influence on long-term rates. The difference between history and today’s world is in the structure of the Fed’s balance sheet. The Fed has been buying government debt. It became a large holder of long-term bonds. According to the Federal Reserve Bank of New York, the Fed held $2,346 billion of Treasury Notes and Bonds of which $703 billion were long-term bonds maturing in 10 years or later (May 20, 2015). In comparison, according to the Treasury Direct, the total value of long-term Treasury bonds held by public was $1,620 billion (April 30, 2015). The Fed is a large holder of long-term treasury debt. In today’s world, the Fed can continue to control the long-term rates. For example, it can sell the long-term government bonds to cause the long-term yield to go higher. This might be the exit strategy the Fed was looking for. As long as there are other buyers of long-term debt, the Fed can reduce its balance sheet. 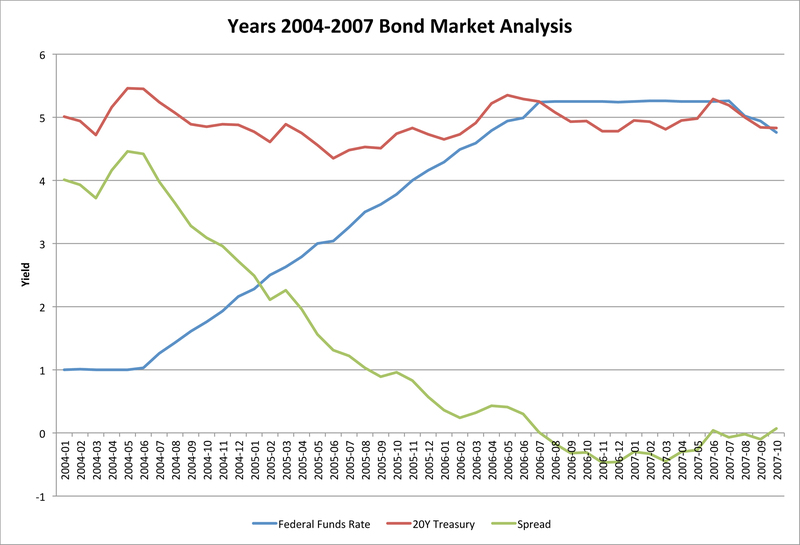 As history has shown, when the Fed starts raising its short-term rates, the public demands long-term treasury bonds. Individual and institutional investors take off risk and purchase treasury bonds. 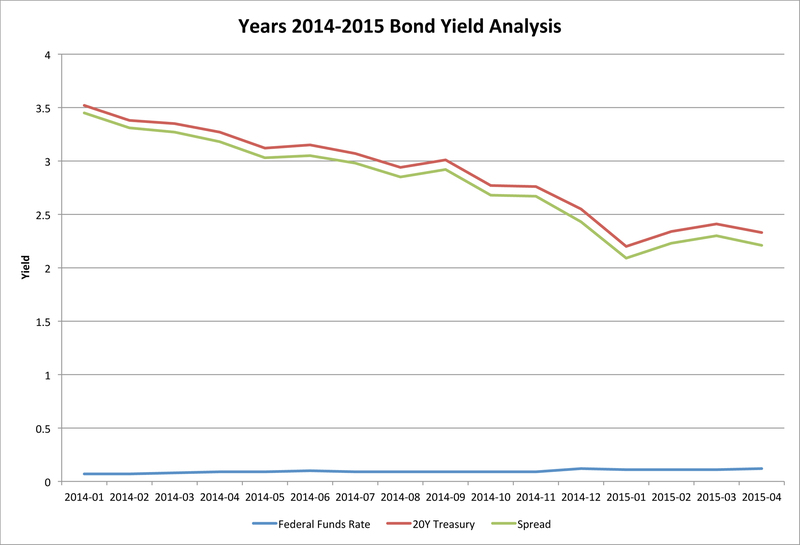 In the year 2015, the Fed may start raising short-term rates and selling long-term bonds. This strategy should keep the yield spread unchanged. The yield curve is likely to have a parallel shift upwards. This will be the perfect exist strategy for the Fed to sell its long-term treasury bonds. The result should be a normal upward sloping yield curve. When you look at different historical periods when the Fed raised its short-term interest rate, you may notice that the yield spread and the stock market performance are negatively correlated. 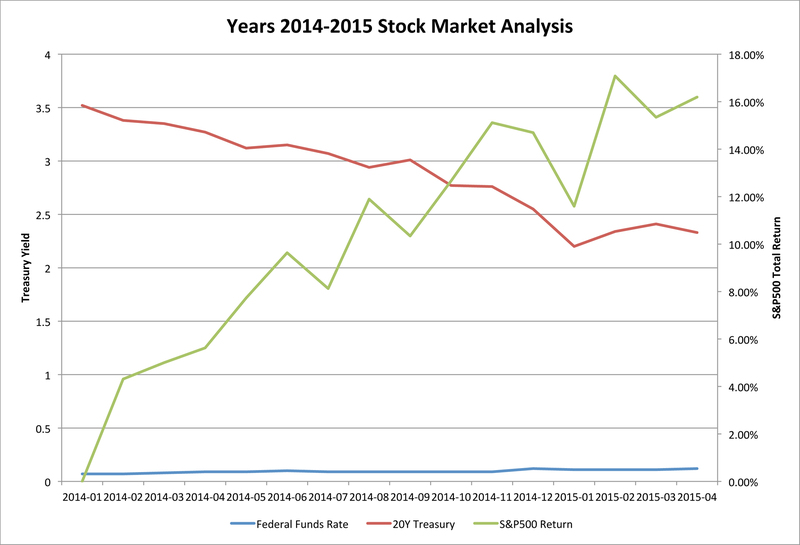 If this correlation continues, the year 2015 may not be a good year for the stock market either. Let’s look at the historical analysis of monetary policy effect on fixed income and equity markets. The first period of monetary policy tightening by the Fed that I will look at is 1993-1995. During this period, the Fed increased its short-term interest rate from 2.99% to 5.74%. The yield spread has increased during the first few month of monetary policy tightening, which means that the Fed did have a strong influence on long-term rates at the beginning. However, after few months of short-term rate increases, the yield spread started to decline. 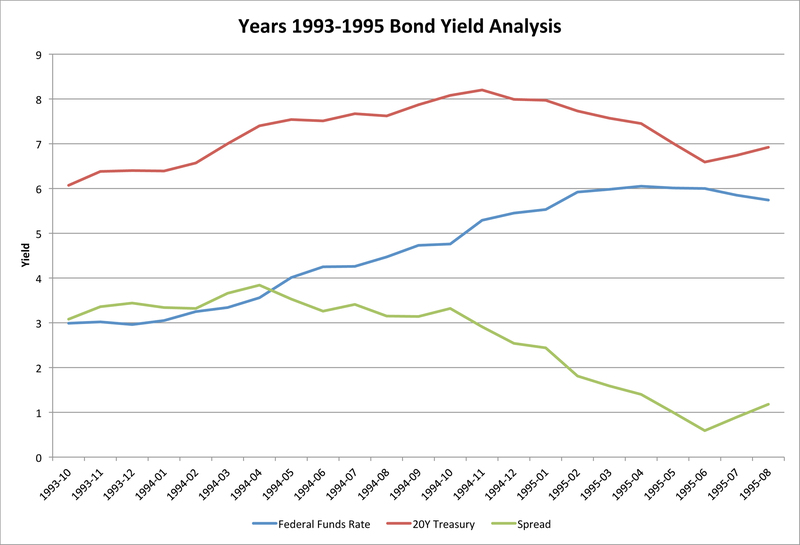 The Fed lost its hold on long-term rates, which started to decline causing the yield spread to contract (see chart 2). 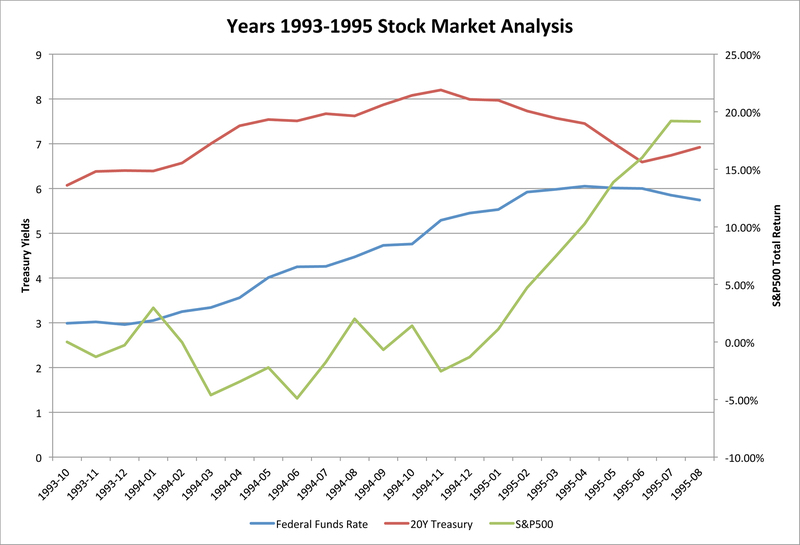 Now let’s look at the stock market performance during the years 1993-1995. During the first year of monetary policy tightening, the performance of the S&P500 Index, broad US large cap market index, was volatile but almost unchanged. Equity investors experienced poor performance at the beginning of monetary policy tightening by the Fed. After year one, when the yield spread started to decline, the stock market appreciated by more than 20% (see chart 3). It is fair to say that the initial reaction by the stock market on increase in interest rates was negative. It can be described as volatile and confusing. Next, I will look at the second historical period of monetary policy tightening by the Fed. During the years 1999-2000, the federal funds rate increased from 4.63% to 6.54%. Similarly to the 1993-1995 period, the yield spread started to increase during the early stage of monetary policy tightening. The long-term rates increased together with short-term rates in a similar proportion. However, one year into the monetary policy tightening, the yield spread started to decline and short-term rates went above long-term rates, which signaled for a recession (see chart 4). This signal has correctly predicted a dot-com bubble crash, which started later in the year 2000. 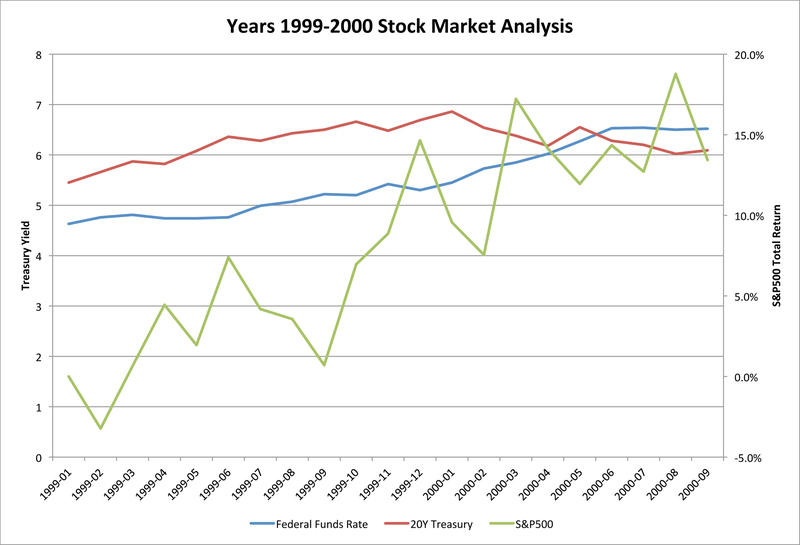 During the years 1999-2000, the stock market performance was volatile. Increase in rates again created unstable stock market. Investors with a strong stomach were rewarded with over 20% return (see chart 5). Monetary policy tightening again created short-term volatility but rewarded long-term investors. Now let’s look at the most recent history of the Federal Funds Rate increases; our third historical period of interest rate increases. The Fed increased its short-term rate from 1% in June 2004 to 5.25% in July 2006 (see chart 6). Surprisingly, the yield spread had a strong negative correlation with the decision by the Fed to raise rates. The reaction by long-term bonds was very different from earlier historical examples. The Fed did not have a control of long-term rates during the years 2004-2007. The market kept a down pressure on long-term rates despite the Fed raising its short-term rate. Investors became more risk averse and bought long-term government bonds pushing the yield further down. In August 2006, the yield curve went negative, short-term rates were above long-term rates. Negative yield curve has correctly predicted the next recession, which started in December 2007. Let’s analyze the stock market reaction to the monetary policy tightening during years 2004-2007. The stock market had a nice 35% total return during that time (Chart 7). The Fed’s interest rate tightening did not have a negative effect on the stock market. Also, as the yield spread declined, the stock market performed well. You can see a negative correlation between the yield spread and the stock market performance. Finally, I will analyze the current year 2015. The Federal Funds Rate has been near zero for last six years (see chart 8). The Fed is expected to start raising its short-term rate later this year. The spread has been coming down recently and is currently at 2.20% between the 20Y Treasury bond yield and the Federal Funds Rate. Despite market expectations for the Fed to raise its short-term rate, the market participants kept on buying long-term bonds lowering the long-term yield. This negative trend in long-term rates shows that there is a demand for long-term bonds. The Fed should be glad to see this demand. For example, if the Fed raises its short-term rate from 0% to 0.25% but the long-term rates continue to move lower, the Fed can simply sell some of its long-term bonds. The entire yield curve will move higher. With each additional increase in short-term rates, the yield spread will remain the same as the Fed sells more of its bonds. Such parallel upward shift in the yield curve is not good for fixed income investors. Now let’s look at the recent stock market performance during 2014-2015. The stock market has increased by more than 16% (see chart 9). This is another example of a negative correlation between the stock market performance and the yield spread. The stock market has been benefiting from low interest rate environment and does not believe that monetary policy tightening will have a negative effect. However, if the Fed can shift the entire yield curve upwards keeping the yield spread unchanged, the return on stocks will be poor. There is a negative correlation between the yield spread and the stock market performance. The initial reaction by long-term rates may result in higher rates and constant or increasing yield spread. This reaction is bad for both bond and equity holders. The price on long-term bonds declines with the increase in yields, and the return on equities is negatively related to the yield spread. After few months since the start of short-term interest rate increases, the Fed may lose control on long-term yields. Outside investors may increase the purchase of treasury bonds, taking the risk off. 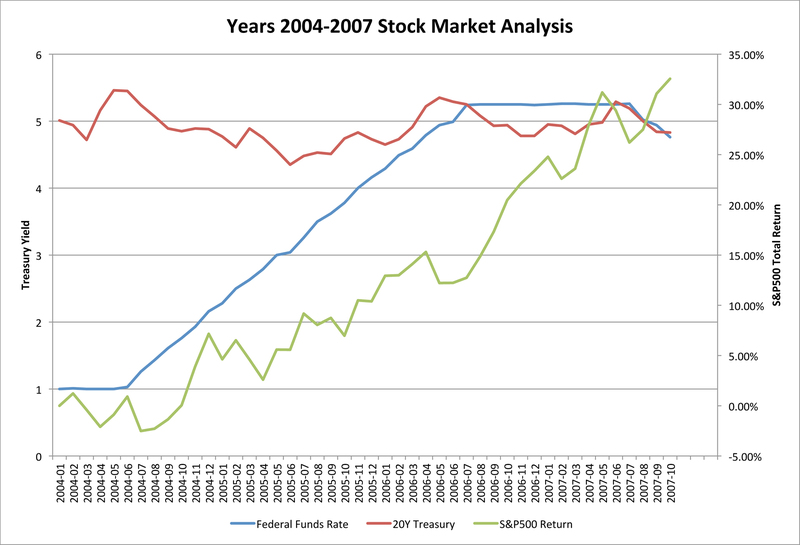 The yield spread between the long-term government bonds and federal funds rate is negatively correlated to the US stock market performance. Historically, the Fed did not have a strong effect on long-term rates. The future can be different from the past. The Fed may sell long-term bonds to outside investors when these investors demand safety. Usually, investing public starts buying long-term treasury bonds few months after the Fed’s initial interest rate hike. This may provide the Fed with an opportunity to sell its holdings of long-term treasuries, keeping the yield spread unchanged. This paper was written as an opinion only. The data is not guaranteed to be accurate or complete. Please consult with your financial advisor before making an investment decision.